Engineered to clients specifications & needs. Suitable Applications: Mining Equipment, Defence Vehicles, Trailers, Forklifts, Cranes, Earthmoving Equipment, Trucks, Buses, Trains and planes. Over the past 20 years TRUFLOW has been providing quality solutions to the large scale equipment industries. Each spray booth is highly customized by our engineering team to suit the needs of the customer. TRUFLOW engineers look at every aspect of the product to determine how it will be painted and what solution will produce the best value. Safety and compliance are guaranteed with all products being produced by TRUFLOW in Australia to National Australian Standards. Chris Spencer, National Manager TRUFLOW Spray Booths. 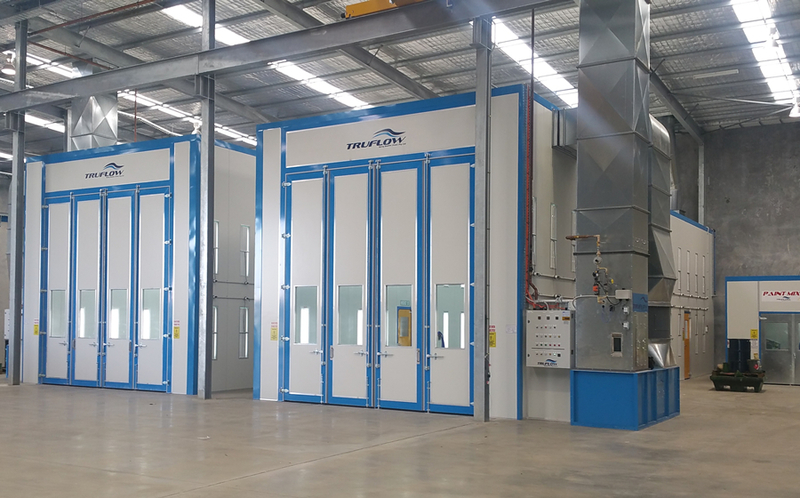 Heavy equipment paint booths designed by TRUFLOW not only fully meet Australian Spray Booth Standards, they offers a large range of spray booth designs for under coatings, corrosion resistance (CCF) as well as high quality top coat finishes specified by OEM’s. When designing such a facility there are key areas that must be addressed. 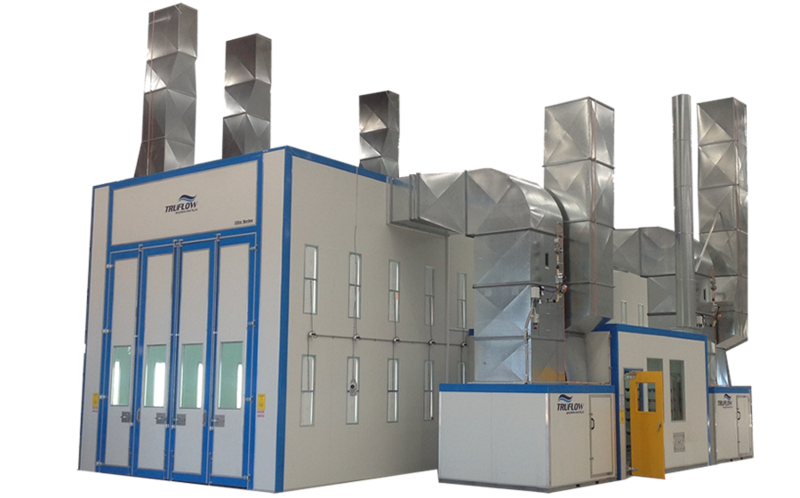 A specialised spray booth facility may require dedicated filtration medias, temperature, humidity controls, and even pneumatic 3-axis man-lifts / liftmans. It’s a holistic approach and all variables must be addressed when engineering and manufacturing your heavy equipment Spray booth. Downdraft and Crossdraft airflow designs need to be considered to meet the finishing requirements of the large equipment you manufacture – it is critical that you meet all your production requirements and we are here to make sure that happens. Our list of customers in this field is extensive; Clients Such as Westrac Caterpillar, Sandvik Mining, Sikorsky Hellitech and Boeing Australia just to name a few. FLSmidth’s Ludowici manufactures vibrating equipment for the mining sector. They are renowned for providing, better performance, better life and higher throughput. They have a complete range of reliable screening and vibrating equipment to suit almost every application and in their Brisbane QLD Facility they surface treat and spray paint these products in a TRUFLOW Spray Booth Oven. Custom designed to suit their facility, the engineering team provided a solution to meet the clients specifications and time frame. Since 1987 Ausplow has been a leader in Australian agricultural equipment. Designing state of the art seeing systems that the company manufactures with a level of pride and resulting quality that is second to none. These quality products see some of the best surface preparation and paint delivered to the equipment by way of blasting and spray painting. 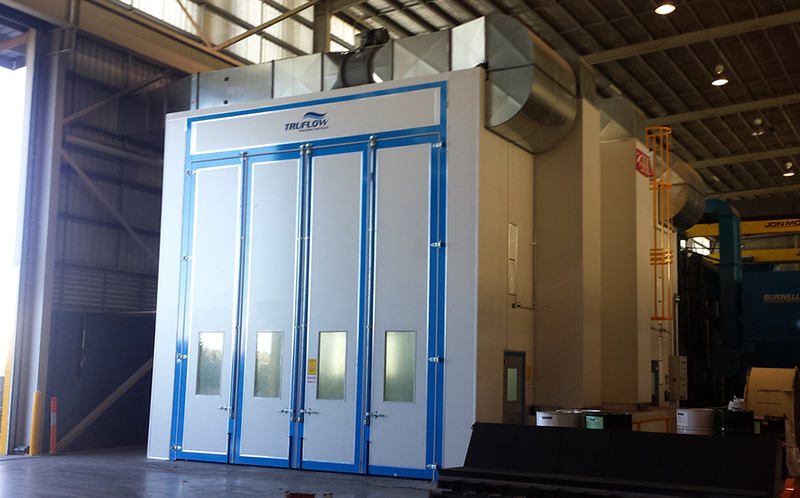 TRUFLOW designed and installed two spraying and baking ovens for Ausplow industries, allowing the company to produce a benchmark surface coating that truly reflects this great Australian product. Ideal for compliantly spray painting industrial and commercial equipment & vehicles. Quality is paramount but so is design – We can solve any spray booth problem for any space. When you are confronted with a unique problem; the solution must be equally as unique. 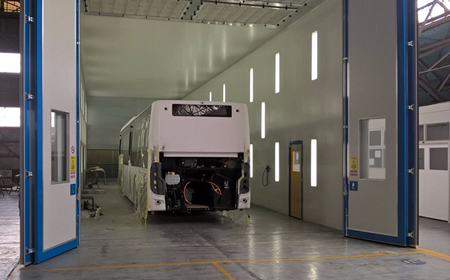 This large scale Bus facility built in Victoria was designed to accommodate a new range of buses which utilise some of the latest technology. Naturally a OEM level finish requires both heating capabilities in spray cycle and curing capabilities in bake cycle. This direct fired gas heated spray booth provides semi down-drafting airflow in a fully enclosed format. Ensuring a clean, bright and well ventilated environment complete with heating. 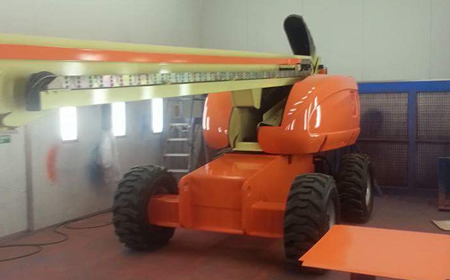 With lifting equipment customers including Coates Hire, Instant Access and Crown Fork lifts just to name a few, TRUFLOW has been the name in spray booths for painting Scissors, forks, knuckle booms and site cranes. With a large range of options in the cross flow spray booths range our team can design a spray booths to paint just about anything. WOULD YOU LIKE TO SPEAK TO ONE OF OUR ENGINEERS? Fill out the attached form to request a quote or infromation.